Since I didn’t get a chance to make any OOTD posts in August, this epic novel serves as my chance to catch up. You’ll notice a trend throughout this posts: skirts and lots of ’em! This summer has been the 2nd hottest summer ever in NYC and as a result my outfits have been repetitive to repel the heat. 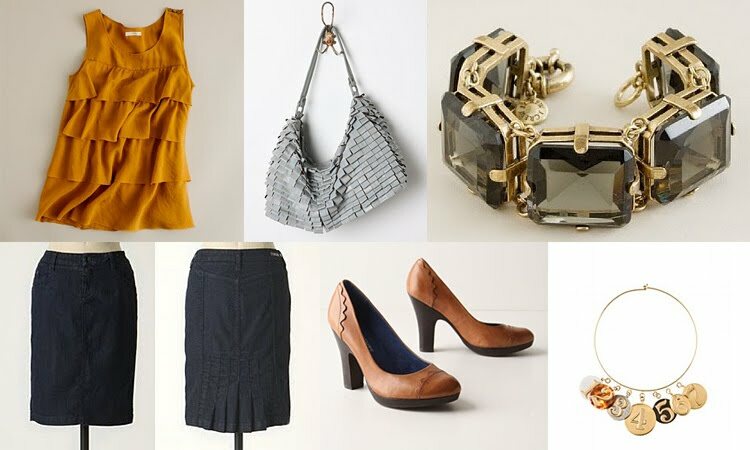 It also made me realize it was time for a bit of a closet purge, so be sure to check out the EA Blog Sale if you’re a size 6-10, or a size 9 in shoes. This post commences with a shoutout to the wonderful community over at J.Crew Aficionada. Many of the JCAs I’ve known and come to love over the last few years have lamented the decline of J.Crew, and in some cases I agree with them. The brand’s new direction has been a rollercoaster ride. Every once in awhile there are flashes of greatness and such was the case with the Coralie Cami, the basis of this first look. A few of the JCAs sang its praises loud enough to tempt me. I took the plunge and ordered it in two colors and WOW! I love it!! It’s so pretty. 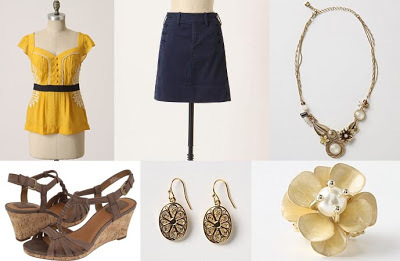 Feminine and easy to wear. I got it in both warm mushroom and pecan. Say what you will about J.Crew — and believe me, I do — but they churn out better colors than any brand out there. The color in the product shot above is more true than my iPhone shots. It’s a lovely dusty pink. I was thrilled that the top coordinated well with my Rosewood Leather Skirt from Leifsdottir. I knew I could make this skirt work for fall but was having some trouble figuring out a good summer look for it. I feel much better about it thanks to this outfit. One other thing I feel good about? The heels. I tweeted about these earlier this week. They’re by Fergie of Black-Eyed Peas fame. Normally I star far, far away from celebrity lines but I was seduced by the gold strappy accents on these platforms. Lo and behold I love these shoes. So comfortable! And they make my legs look fantastic. So, uh, go Fergie? Shoes: Fergie Tazed in taupe ($90) — get 15% cashback on Piperlime orders this weekend through ebates! Yellow was my sister’s favorite color when she was a kid, and I remember not really being able to wear it. As an adult I’ve been unable to resist incorporating it into my wardrobe. It still looks much better on me in those rare cases that I am tan but it’s such a great color that I can’t resist wearing it even when pale. Yellow just makes me happy! I snagged the Solar Star Blouse on surprise sale a few months ago at the Rockefeller Center Anthropologie and it’s been heavy rotation this summer. In fact one week I made the mistake of wearing it twice. One of my coworkers noticed (oops) but luckily we just had a good laugh about it. I took this photo when my hair was two inches shorter. 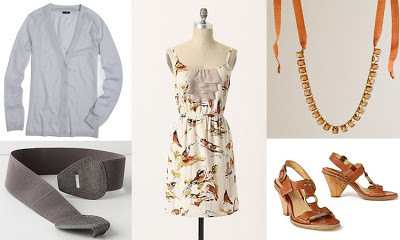 I have been collecting outfits for awhile for this post! Though the waistband is black I paired it with the navy Sailing Hobbyist Skirt, mostly because I felt black would be too heavy for August. I love the top’s sweetheart neckline though I wish the sleeves were just a bit longer. The best part is that since the top has black in it I can throw a black cardigan over it and wear it any season. Versatility is love. Has anyone else seen the new versions of the Pessinus Garden Necklace in-store? One version has larger flowers, and one version has the same elements as the Pessinus Garden but more spread out on the chain. Neither is online yet of course, because Anthro would rather have me struggle to describe them without a name to peg to them. Fine Anthro! I’ll give them ridiculous names til they show up. I’m calling one the Over Pessinus’d Necklace and the other the De-Pessinus’d Necklace. So there. Over time, I’ve learned never to delete an item from my Anthropologie wishlist, even if it’s sold out. Why not? Because every once in awhile the item will pop back into stock. Despite selling out over a year ago, one of EA’s community members managed to snag the Lucky Numbers Choker last month when one popped back into stock. When the necklace didn’t work out for her, Stephanie reached out to me to see if I was still looking for it. I was! I wore it immediately and then for about a week straight. I’m so thankful for the great community we have here and on all the Anthro blogs. I love how people help each other out with hunts! Everywhere I went people were asking me about the necklace. It has a truly whimsical feel to it with its numbered lockets. I had fun pulling out the different locket colors for the other components of this outfit. …while the variation directly above is the more casual option. And hey, while I was wearing my kickers I figured it was time to bring preppy back, so I dug out my grey Converses and rocked that on the streets. It’s strange but great how Converses bring the world together. On the subway some guy showed me his identical kicks. I ate lunch at Shake Shack and some motley crew came up to me to compare their (much color graffitied) versions to me. Even the engineers at work loved the shoes. It was awesome! Here are the looks side by side. I’m sure that I’ve said this before but I love working in an office where jeans are OK! At my first NYC job they were not and I’m still bitter about the money I wasted on chinos. Denim all the way, baby. As with full-length jeans, it took me several brands before I found the right fit. That’s why both of these crops are by AG — their crops fit me best. I spent a whole day running around the city, going to different denim bars yet at the end of the day I found exactly what I wanted at Anthropologie. Who could’ve guessed? I had a hard time waiting for weather warm enough to wear my Skyfall Dress. The first time I wore it to work I made the mistake of not bringing a cardigan along and I froze in my office, where you’d be cold in a parka. So the second time around I roasted outside but was comfortable at work. The dress is definitely shorter than I remembered it being so I’ve since taken it out of work rotation. I also have to be very careful when walking down the subway steps as an errant breeze could be too revealing. It was a chorus of blues in this outfit. I adore the cardigan, especially how it snaps closed under the yellow flower. I was a little warm in it outside but it was worth it to keep the chill off indoors. Apologies for the headless review-style shots. 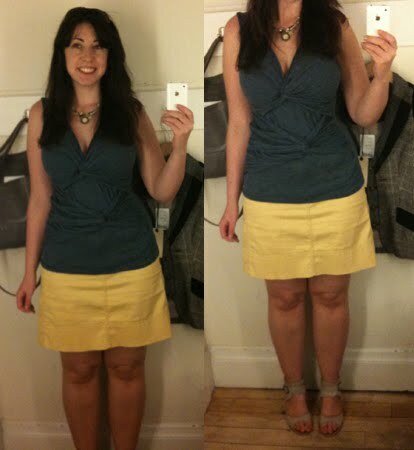 The fitting room was too small for me to get a head-to-toe shot. I have to mention my gorgeous necklace, which I bought from the super-talented Shannon’s Dressing Room Jewelry Etsy shop. 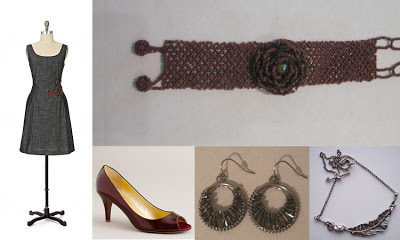 I have long admired the designs she showed off on her blog, and had been admiring a couple of designs for awhile. But when this beautiful Two-Wheeler necklace came along I had to have it! I ended up buying two necklaces. The other one will appear in a look a bit further down in this post. This casual weekend look has a slightly harder edge to it courtesy of J.Crew’s Fenton/Fallon Carrington Collar Necklace. I continue to loooove this necklace so much. I’m thrilled J.Crew did the collaboration to bring Fenton/Fallon’s pieces into my price range. The grey sequin tank was an impulse buy at Ann Taylor LOFT a few months ago and I must say it’s held up really well. I’ve washed it four or five times now which is about when their tops really start looking bad normally but this one hasn’t pilled nor has it lost a single sequin. (Hopefully I did not just jinx myself.) I will be sad when this top dies. I love that the sequins are focused towards the top of the shirt, not covering the entire front. It’s a well thought-out design that was similarly taken on by J.Crew. I actually like the LOFT version better. My skirt is a darker blue that the composite shot shows — I wasn’t able to find the exact skirt on either Target’s website or through Google. I think my favorite part about this look was that with my sunglasses on people actually moved out of my way on the sidewalk. That almost never happens and it allowed me to make great time. Not that I’m really all that tough. When the Ambling Twists Tank hit sale, I immediately picked up the blue version to join the green already in my closet. It’s a surprisingly versatile top and very comfortable. My brain has issues reconciling the off-center lower twist though. I am fine with the shirt on but any time I see myself in a mirror (or when I’m composing OOTD posts) I just want to center it! My head hurts just thinking about it. This outfit has served as everything from a work look to a casual date look to a running errands look to meeting up with friends look. It’s the best kind of look! 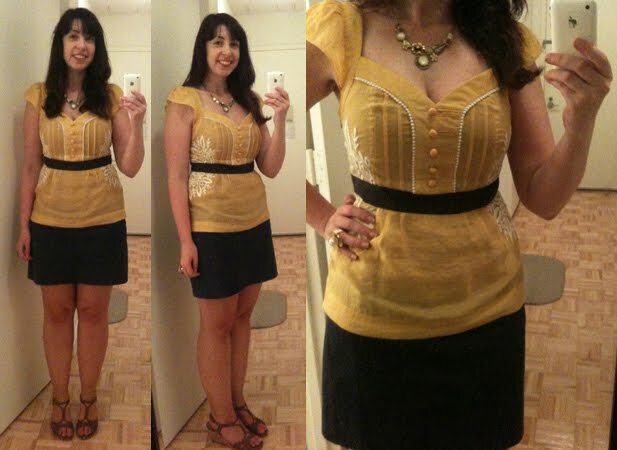 I love how the bright yellow skirt makes my legs look much tanner than they are and the top frames my face well. I can’t say enough great things about the tank — if you’re on the fence you should really pick it up before it’s gone! The Seamed & Slouched Crops ($118) may not be nearly as loose on me as they are on Anthro’s models but I love them anyway. They have both equestrian and motorcycle detailing to them in a fabric that feels oh so slippery and nice. Well worth full price in my opinion. I wanted to try something a bit different with them, so instead of pairing my usual ruffled top with them I went for something sleeker. It’s a twist-back racerback tank from Barney’s Co-op that I layered over a grey tank. The result was something quieter than I’m used to and I liked that. 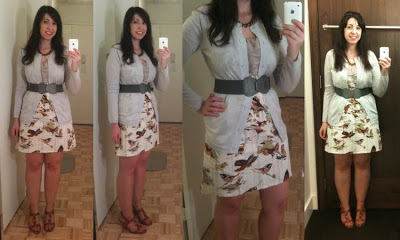 A little layer in the day I was having whimsy withdrawl so I threw on my Pretty Sporty Cardigan over it. Ahh, back to normal. 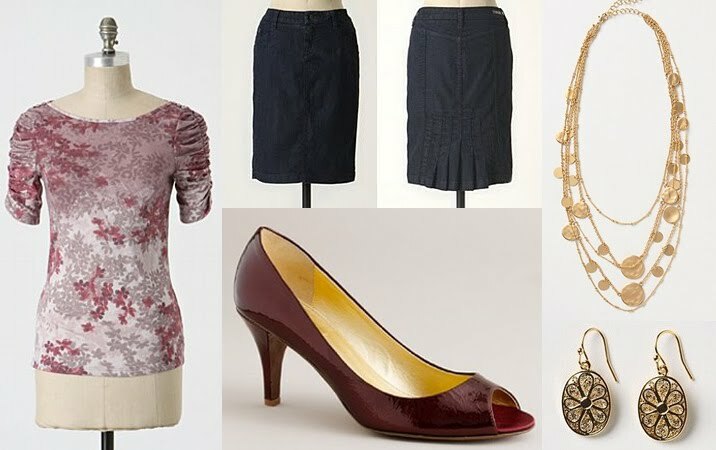 This outfit was inspired by Kathryn of In Pursuit of Pretty Things. She paired the Bits of Pearl Blouse in grey with the Scalloped Dots Skirt in one of the outfits in this post. 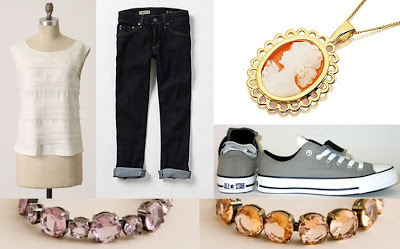 I love that blouse and included it in a recent OOTD set of my own. It reads as blue to me so I put my own twist on the look by swapping the Bits of Pearl out in favor of the blue Buds and Bunches Tank. The temperature hit over 100 degrees on this day so I was willing to wear thinner straps to work. 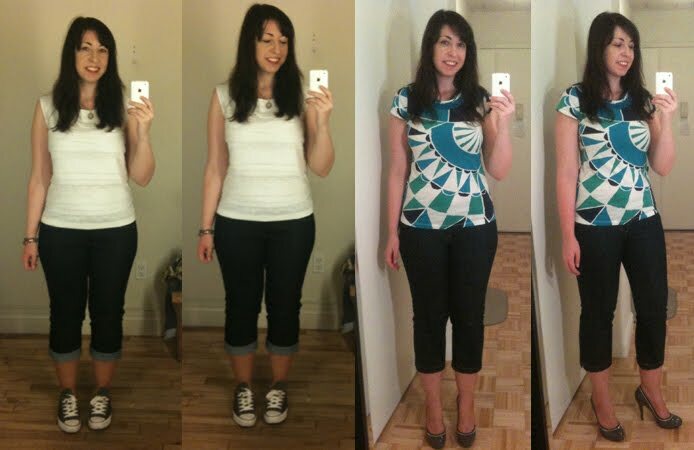 The end result is a great triple-digit work outfit. 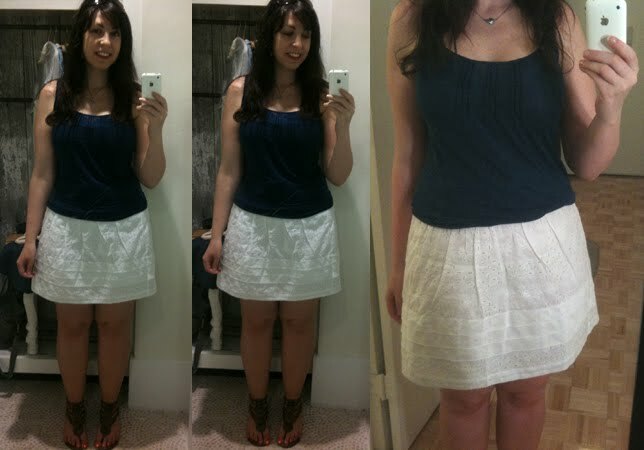 I hadn’t really thought of the skirt as summer-appropriate before so thanks Kathryn for expanding my horizons a bit! Rather than tucking the top into my skirt which reveals the waist gap I always deal with I instead folded the tank under. Its elasticity held it in place nicely for the day and most importantly I stayed decently cool. In the winter I could replicate this outfit, add a cardigan over it and be set. Lace has come back in a big way. It’s so tempting to buy lace everything, isn’t it? Tops, skirts, dresses, gloves…whatever! 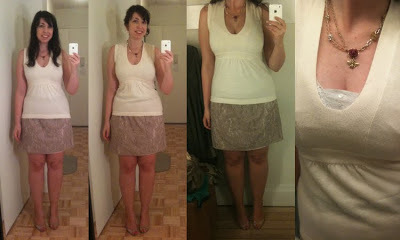 I’ve forced myself to lay off but not before I caved on the fantastic Lace Skirt from Ann Taylor LOFT in this outfit. The quality was good enough to snag the skirt on sale. I’m thrilled with the skirt so far. 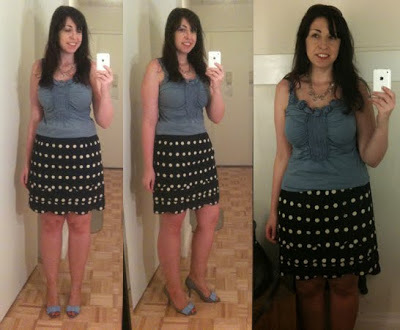 I sized up 2 sizes so I could hipsling the skirt for more length — it’s really short! Then I played around with my hair a bit (I eventually settled on a messy updo). Then I was ready to face the day! And as it turned out, the night too. The necklace in this look is the other item I purchased from Dressing Room Jewelry. I adore the bee charm and the double layer of charms. Shannon doesn’t currently have it in her store but I’m sure if you contact her and the components are still available she would make it! I wore the outfit above to a client meeting. 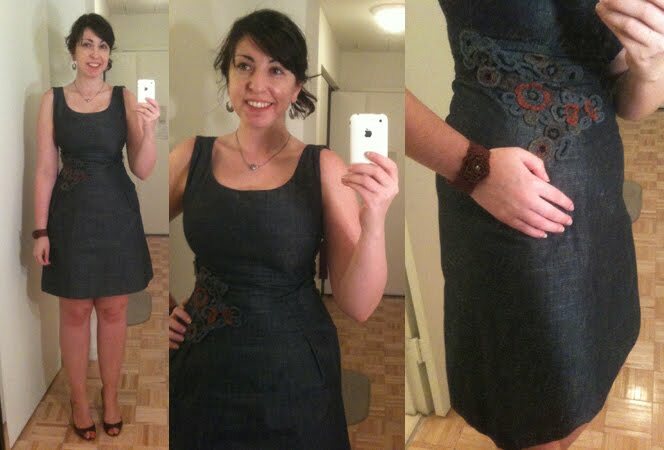 Have I mentioned that the Ferrous Flower Sheath is my favorite Anthropologie dress ever? It’s the perfect length! It has work-ready details and whimsical ones! It’s so pretty to look at and equally fun to wear. It’s funny. Since skirts and dresses are so short these days this dress looks long to me. But really it’s just right, skimming my knees as I want a work dress to. It was warm enough that I didn’t need anything over the dress and the straps are thick enough so I didn’t have to sweat it out in a cardigan. With some red accent pieces (my peep toes and bracelet) I was ready to go and knock some socks off. 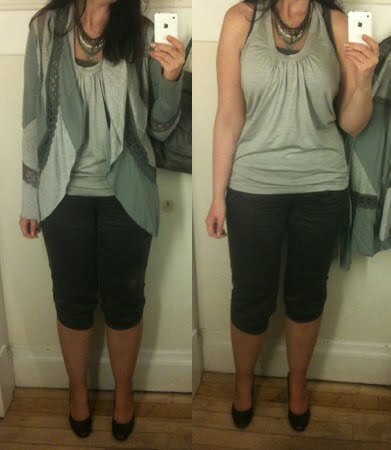 Another Anthro piece I’m head over (red) heels for is the Muted Lavender Top ($58). 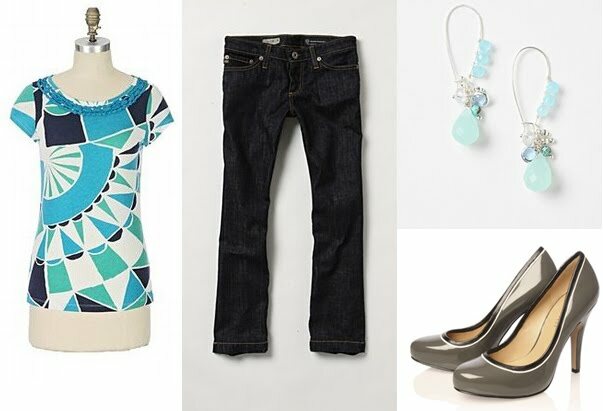 High necklines can be tricky with a bigger bust and the similarly cute Curated Tee (now $30) didn’t work for me. The pattern on this version helped make it work. 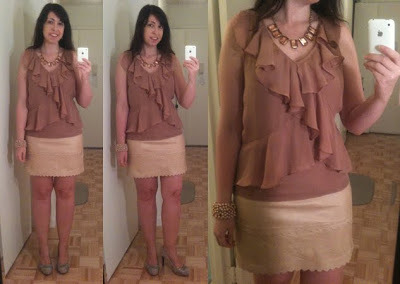 Paired with a pencil skirt and a pretty necklace for work, this top made me feel great! Great enough that I made some really strange faces while taking these photos. 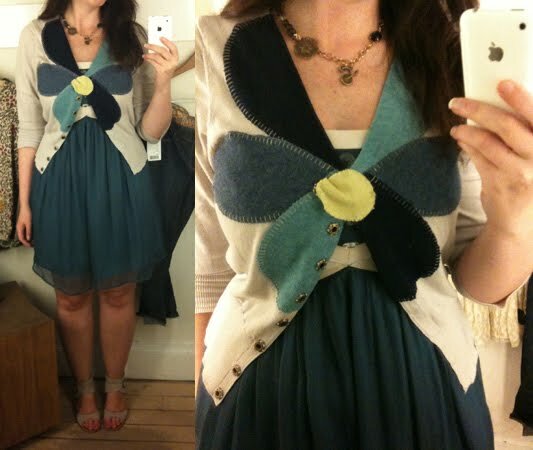 As promised in my review, with the right cardigan the Distant Chirping Chemise ($58) worked for work. 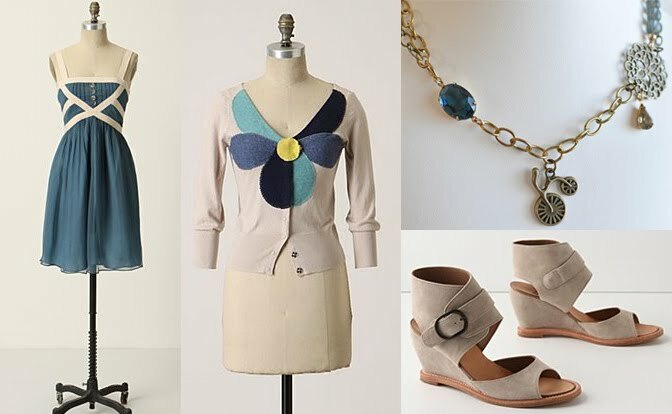 On another recent high-90s day I threw my Michelle Cardigan from J.Crew on over the chemise and a thin slip underneath and headed out to face the day. The next weekend I changed it up by throwing a tank on underneath the chemise so I could fully show off the beautiful bird pattern. All in all it offers a lot of options for summer and fall and I’m so happy with the purchase. 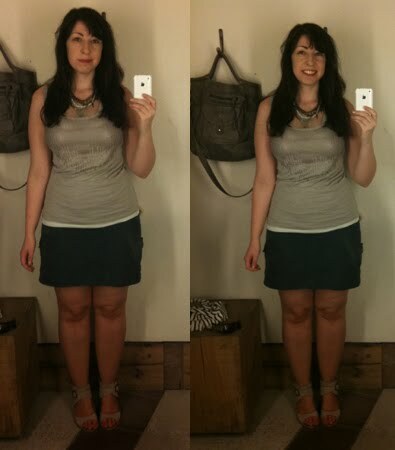 I took the left two photos in the Chelsea Market fitting rooms. I have noticed that many rooms seem to have this issue — despite the bright lights on the mirror the overhead ones are rather overpowering, creating dark shadows. Not every room is like this and it’s not as bad as it looks in the photos but it is hard to make out details when I’m trying on dark-colored clothing. As for the outfit itself, the tank is something I grabbed at the Gap last year and I feel like I wore it practically every day. It’s perfectly light and pairs well with the eyelet skirt. I threw on two silver necklaces and my sunglasses to complete the summer weekend look. One last weekend look to round out this set. The tank top (from J.Crew) is pretty much the perfect summer top, what with its ruffles and flowers and more ruffles and more flowers. 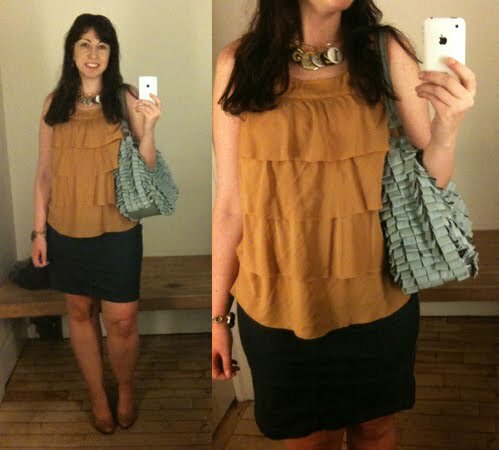 Much as I am getting ruffled out from all the new options in stores, I like having ruffles! Just not everywhere. So I chose a simple skirt to pair with it — the Sailing Hobbyist in pink. 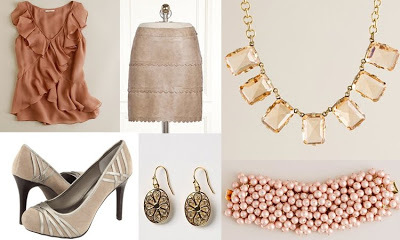 The necklace in this set is another one of the pieces from Ann Taylor LOFT that really works for me. I couldn’t find a shot of it online and used a close approximation but I do have a better close-up in this photo from an older OOTD set. It’s champagne-colored which was a stroke of genius among all the other gold and white pearl pastiches that were out last fall. 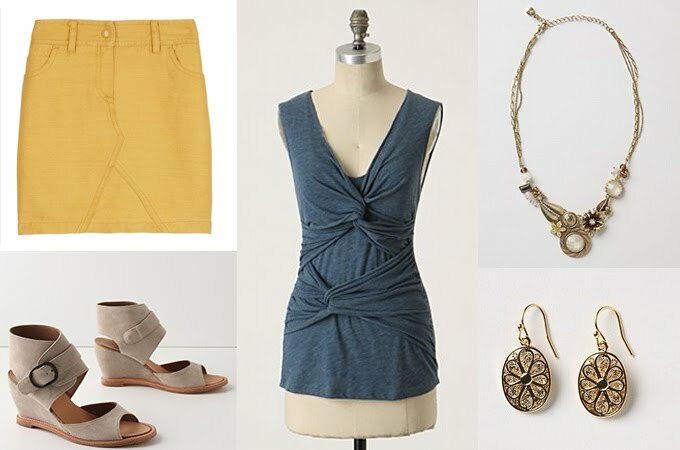 Add in my ever-trusty White Sands Wedges and we’ve got a look! !